True to the GTS Porsche spirit, the new 911 GTS models provide even greater performance, efficiency, distinctive design and a sporty sound. 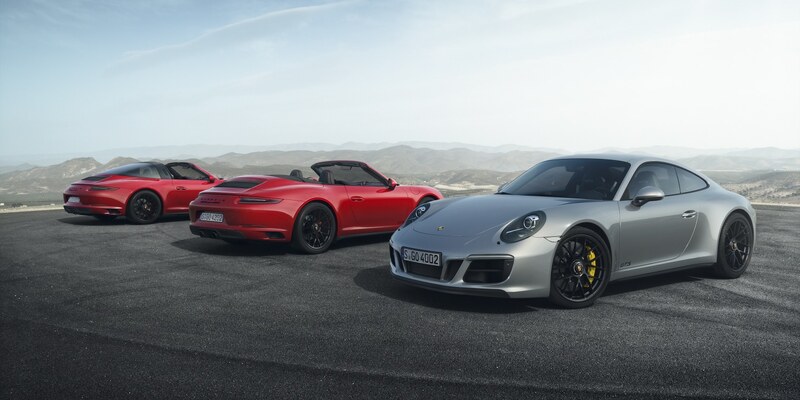 Five variants are available in total: the 911 Carrera GTS with rear-wheel drive, the 911 Carrera 4 GTS with all-wheel drive - both of the above available as a Coupé and Cabriolet - and the 911 Targa 4 GTS. The newly developed turbochargers for the three-litre, flat-six engine give the sportscars a performance boost of 22 kW (30 hp) compared to the current 911 Carrera S models (and 15 kW (20 hp) compared to the previous GTS model with naturally aspirated engine). All models are available with a manual seven-gear transmission or optional Porsche Doppelkupplung (PDK). The three-litre, six-cylinder bi-turbo flat engine with newly developed turbochargers develops 331 kW (450 hp). The maximum torque of 550 Nm is achieved between 2,150 and 5,000 rpm. The new 911 Carrera 4 GTS Coupé with Porsche Doppelkupplung (PDK) and Sport Chrono Package sprints from zero to 100 km/h in 3.6 seconds. For the rear-wheel-drive 911 Carrera GTS Coupé with manual transmission, the top speed is now 312 km/h. Fuel consumption is lower than the prior models with naturally aspirated engines by up to 0.6 l/100 km. The wide Carrera 4 body also gives each GTS model a 44 mm broader track width across the rear axle. This reduces lateral body movement and provides even better cornering stability. As standard, the GTS is equipped with 20-inch centre lock wheels painted in silky black, derived from the 911 Turbo S. The sports chassis with Porsche Active Suspension Management (PASM) lowers the body of the GTS Coupés by ten millimetres compared to the 911 Carrera S (-20mm total). The Sport Chrono Package is fitted as standard equipment on all GTS vehicles. Optional rear-axle steering improves handling while providing even greater stability at higher speeds. The new SportDesign front apron gives the GTS a look distinct from other Carrera and Targa models. The aerodynamically optimised front end with low front spoiler and higher rear spoiler extension reduce the lift forces on the front and rear axle. At the rear, smoked tail light lenses, black logos, air intake grille and a central black exhaust tailpipe make the GTS unmistakable. The rear-wheel drive models are further set apart from the C4 versions by a black trim strip instead of a light strip between the tail lights. SportDesign exterior mirrors and centre lock wheels painted in silky black complete the side view. For the first time, the 911 Targa 4 GTS also features a black Targa roof bar as standard. A sports exhaust system as standard and reduced sound absorption in the pipes provide the characteristic GTS sound. Sporting ambience in the cockpit: GTS passengers sit on Alcantara sports seats with a new stitching pattern. The interior trim strips are made from brushed aluminium with a black anodised finish. The steering wheel rim, centre console and armrests are trimmed with Alcantara. As an option, the rear seats in the Coupé can be removed to save even more weight. The Porsche Communication Management (PCM) system with touchscreen is operated as easily as a smartphone. It features the new Porsche Track Precision app as standard, which can be used in all GTS models for the first time. This enhancement from the world of motorsport allows automatic recording, detailed display and analysis of driving data on a smartphone.